The Buddha often spoke of experience comprising of five khandhā – meaning sections or aggregates. Interestingly, as well as factors of identity, they can also be seen to cover all conditioned experience. When clung to, the khandhā can increase our feeling of ‘self’ or ‘other’, and in turn, when not clung to, they can help to liberate ourselves from this sense. This course will encourage us to explore the meaning of the terms, experience how they operate and direct them towards liberation. Time will include regular meditation periods, talks and dialogues. 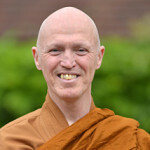 AJAHN SUCITTO was born in London; he entered monastic life in Thailand in 1975 and since 1978 has lived in Britain. He has been teaching Dhamma since 1980, both in meditation retreats and in talks given regularly in monasteries. He has written a number of books and teaches worldwide. Please note for this retreat there is also the additional option of camping at a reduced rate. The International Theosophical Centre is the home of the Theosophical Society in Europe. The Centre is located approximately 20 km from Amsterdam close to the town Naarden. The grounds consist of 15 hectares beautiful woods and gardens with the original old mansion St Michaels House located in the middle. Apart from theosophical activities the Centre is also used by other meditative organisations such as yoga schools, Buddhist groups, and Sufis. Any stay at the centre is meant to promote quietness of mind, peace and a harmonious life.